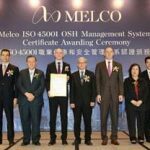 Melco Resorts & Entertainment Limited (“Melco”) is pleased to announce it has become the first gaming operator in Macau to be awarded the ISO 45001 Occupational Safety and Health (“OSH”) Management System Certificate across its entire portfolio of properties, including City of Dreams, Studio City, Altira Macau, Mocha Clubs and Melco’s Macau & Hong Kong corporate headquarter offices, recognizing its commitment on managing Melco’s OSH risks and providing a safe and healthy workplace for its employees. 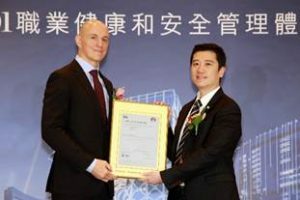 At an event attended by Mr. Wong Chi Hong, Director of Labor Affairs Bureau (DSAL), Dr. Suen Ka Hung, Director-General of Macau Productivity and Technology Transfer Center (CPTTM) and other guests, the Certificate of Melco ISO 45001 was received by representatives from Melco’s senior executive team. 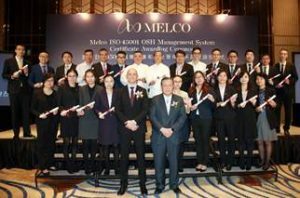 The event also celebrated the achievements of Melco employees who have successfully attained ISO 45001 SMS Training Certificates and OSH awards. The Company’s OSH Policy, established since 2008, demonstrates Melco’s commitment to workplace safety that stems from senior management to all levels of the company, including educating employees, suppliers and subcontractors on OSH awareness to the prevent work-related incidents throughout all its entire portfolio of properties. In 2015, City of Dreams was the first hotel and integrated resort in Macau to be awarded the OHSAS 18001 Occupational Health and Safety Management Certification. In March 2018, the OHSAS 18001 certification transitioned to the truly international, consensus-based standard ISO 45001.